The main aim of gait re training for those with knee pain is to reduce the load at the knee. There have been various studies showing that using methods of teaching such as Pose and Chi reduce loading at the knee (although the load must be moved elsewhere which is another argument in itself). Before I hear shouts of ‘one size doesn’t fit all’ and the footstrike debate takes hold just take a deep breath, listen to soothing music and look at what we can take from the basics of these methods. 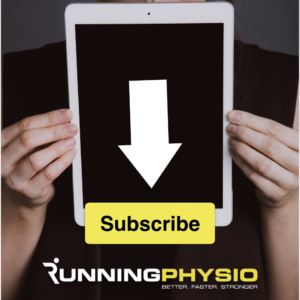 Lets look at why these methods may reduce loading at the knee and what this means for a runner suffering with knee pain, how gait modifications may help and how this can be implemented. Landing with a bent knee. Landing under the hips/center of mass. Noticeably, most if not all of these points crop up in many coaching practices. 1 – Landing with a bent knee is paramount. How do you know if its bent?….. Get filmed and if you look like the runners in the image below then bend that knee and use that suspension! Stop using the quads to extend the knee. 2 – Landing under the hips. Reducing the overstride goes hand in hand with stopping the straight knee landing. Landing more under the hip stops the knee extending and quickens the cadence. In the image below you’ll see the results from a bit of coaching and some hard work on the athletes part. The magnitude of the heel strike has gone down, the knee is nicely bent and hopefully the load on the knee will be reduced. Upping your cadence has the effect of helping shorten the stride. I believe it’s a product of form not that good form comes from quick cadence. BUT upping the cadence will help with shortening the stride. A slow bouncy runner is likely loading the knee up. 4 – Relaxed tension free landing. If you are bracing and tensioning the leg muscles you will have a contradiction of forces and leverage. A relaxed springy leg is doing its job correctly. Think how relaxed your legs feel running on the spot. You have a nice quick cadence (hopefully!) and nicely springy legs. Being in alignment allows you to take advantage of all the above and avoid compensation patterns. For example, looking down at your feet means you will be slightly off balance although you will be great at dodging dog muck! Try standing flat against a wall, heels bum and shoulders touching. Now put your arms out in front and feel the tension in your feet. Balance and posture go hand in hand. Run tall and don’t slouch. Lean should come from the ankle. So importantly and more to the point (and I think Tom was after a few brief notes) how can we implement gait re-education to the athlete suffering knee problems. Drilling in the movement pattern required will hopefully lead to that pattern of movement becoming habitual. Building perception and feeling of what is happening is highly important. If you don’t know what is required and how that feels then how can you tell what you are doing. Unfortunately peoples perception of what is happening is not always what is actually happening and form coaching can be extremely frustrating for both coach and client. What works for one doesn’t always work for another. And be aware that it takes time and won’t happen over night after one intervention. Start off with standing. Knees bent, nice and relaxed and springy. Now run on the spot and feel the knees being all springy. That’s how it should feel when you have your bodyweight on the ground. Now go on to one leg in the same position. (*Don’t lift the knee up, fold the ankle under the hip) Can you hold this position without the hip dropping or adducting? If not you need to strengthen the glutes and work on holding these positions. The drills are exercises themselves. Progress to moving forward using the same drill. Drop the foot to the ground without swinging the lower leg out in front. Gravity will get your leg down so forget about that leg. Concentrate on holding the body in alignment and not letting the knee straighten. Metronome on your mp3 to keep your cadence up. Get video taken to reassess what you are doing. Run on the spot whilst behind a start line of a track/ mark on pavement etc. Grab that thought and as you run imagine that you don’t want step over that line. Tom was after specific advice regarding hip adduction/femoral rotation with regards to PFPS which I seemed to have swerved. But I believe you have to look at the whole person rather than one area. A strengthening programme targeting the glutes is likely needed, especially if they can’t hold the various positions in the drills. Some think that the role of the glutes is one of stabilisation during stance/support others claim its propulsion whilst in hip extension. Which ever it is the glutes need to be given the opportunity to function and control. Control of the glutes can be targeted with box jumps, step offs, squatting, feeding the error etc etc. Do the exercises in front of a mirror or window reflection so you can see whats happening. But also what is needed is the habitual position and movement pattern and the perception of the movement. And remember that adaption takes time. Any pain that isn’t DOMS means you are likely irritating something. Stop, recheck what you are doing or seek the advice of a technique coach. And don’t give up after a couple of sessions. Too many runners try to change technique whilst still banging out the miles. Reap the long term rewards by sacrificing time to drills and practise. We all seem to practice and refine movement skill in swimming, dancing, gymnastics, lifting etc. I don’t figure why running should be any different. Reduced eccentric loading of the knee with the pose running method. Med Sci Sports Exerc. 2004 Feb;36(2):272-7. Great blog. Running technique is often overlooked when it comes to discussing running injuries and their treatment. I work predominantly with runners in my Physio clinic. These days I always consider running technique with recurrent or on-going injuries. I use gait analysis and gait-re-education programmes alongside more traditional Physio techniques. It makes perfect sense that for a repetitive sport like running, the way that we are repetitively moving will determine where forces go and which of the bodies tissues are loaded. From my own clinical experience, technique errors, particularly over-striding, are prevalent in those who suffer with ‘runners knee’ and shin splints. These are ‘the big two’ that I see, where gait re-education produces really consistent results. In the past my treatment of these conditions involved lots of rehabilitative exercise and some manual therapy. Gait re-education has provided a great missing link- yielding more significant results, in less time. Great piece. It has given me some food for thought regarding my patients who are runners!